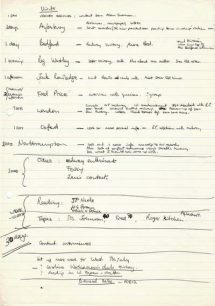 You are here: Home>Archive>All Change>Research process - 'All Change' an original musical documentary play (1976-1977). 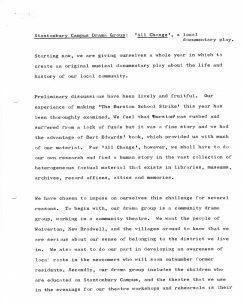 The project was to create ‘All Change’ an original musical documentary play. This would involve research to ‘find a human story in the vast collection of diverse factual material that exists in libraries, museums, archives, record offices, attics and memories’. Developing an awareness of local roots for the newcomers in the new communities. The title, ‘All Change’, suggests both the ‘railway connection in our local community and the impact of our new city on its original inhabitants… once before, this area was subjected to radical change by a decision to build a new town. The new railway age required the new town of Wolverton to be built and the pre-existing local communities had to adjust to that fact. In time, of course, the new town absorbed the people, and new social and community patterns developed… Could our group, we wondered, by an honest and imaginative exploration of the facts of the first great change, help people to find meaning in their experience of the present day one? Details of Project brief and proposed budget for 'All Change'. Notes on locations for visits and schedule of interviews. Research notes about 19th Century local issues. 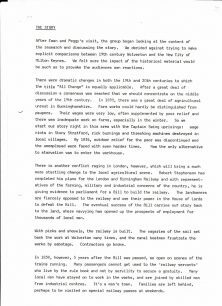 Notes compiled by Ted Pankhurst about Wolverton Works and the railways. Notes compiled about 'Men at War' an article in the Chronicle and Echo. 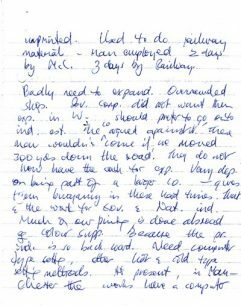 Handwritten notes on an article ‘Men at War’ by L.W.Dickens published in 1976 in the Chronicle and Echo, concerned mainly with the General Strike. Notes also include brief references to local churches and Mrs. Warren, a researcher from Yardley Gobion. Notes on an interview about the origins of the Bradwell Good Samaritans Society. Interview notes with Mr Alderson the secretary of the Bradwell Good Samaritans Society about the start of the Bradwell branch in 1872 and a description of the society’s role as an early form of medical insurance, a small weekly payment ensured access to hospital when required. Draft of 'Locked in the Homes and Heads of Wolverton and New Bradwell' by Margaret Broadhurst. Draft list of sources and books. 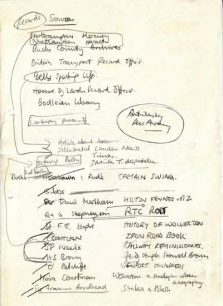 Handwritten list of sources including, newspapers and books. All Change' Newsletter - November (1976). The issue contains updates on the project, updating the progress on the research, music, storyline of the production which includes Peter Cheeseman’s suggestions and the formation of a production team. Item: Details of Project brief and proposed budget for 'All Change'. Item: Notes on locations for visits and schedule of interviews. Item: Research notes about 19th Century local issues. 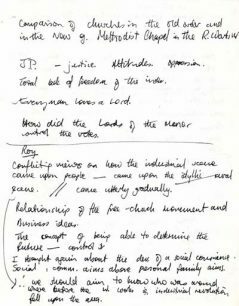 Item: Discussion notes - Ray Bellchambers about source material for 'All Change'. 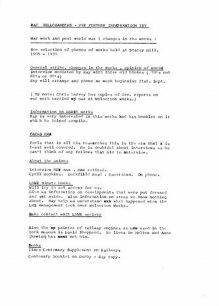 Item: Notes compiled by Ted Pankhurst about Wolverton Works and the railways. Item: Notes compiled about 'Men at War' an article in the Chronicle and Echo. 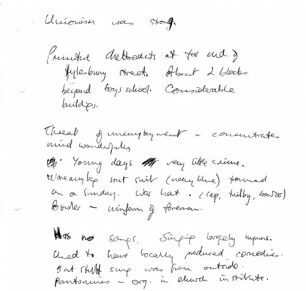 Item: Notes on an interview about the origins of the Bradwell Good Samaritans Society. 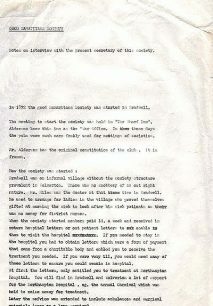 Item: Draft of 'Locked in the Homes and Heads of Wolverton and New Bradwell' by Margaret Broadhurst. Item: Draft list of sources and books. 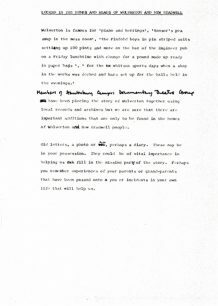 Item: All Change' Newsletter - November (1976).